February 15, 2016 -- At its meeting this past Thursday evening, the North Shore School Board set up a schedule to interview five headhunting firms, one of which will be selected to conduct the search for a replacement for Schools Superintendent Dr. Edward Melnick who will be retiring at the end of the 2016-17 school year. The interviews must take place at a public board meeting. The first will be held on February 25 and two each will be conducted on March 10 and March 30. Two of the trustees, Toni Labatte and Michael Nightingale, said that they had come into this past Thursday's meeting believing that only three of the firms seemed suitable for what the district was looking for, but were amenable to Board President Dr. Herman Berliner's suggestion that all five who had responded to the district's request for proposal (RFP) be interviewed so as to "conduct as complete a process as possible." Back in October, when the Board first discussed the process it would use to find a new superintendent, Dr. Berliner advised the trustees to select a firm that would be as transparent as possible with the district - in particular with regard to providing information concerning the entire pool of candidates it looks at and not just the finalists. It's important to know "who they didn't bring to you," he said. Many search companies deal with multiple districts, he continued, and it's important to know how "the firm determines which districts get what candidates." "They need to assure us that they are not doing a similar search for a district in the area or in a school we're in competition with," he explained. "I don't want information withheld. I want to know where we stand with regard to other districts." This past Thursday night, Dr. Melnick requested that the board submit questions in advance, so that the firms would be prepared for the half-hour long interviews. Superintendent Dr. Edward Melnick stated at this past Thursday's North Shore Board of Education meeting that the district would not disseminate an informational letter to parents from the New York State Department of Education regarding this coming spring's Math and English/Language Arts standardized testing for students in grades 3-8. He explained that the notice contained inaccurate and misleading information that appeared intended to quell the Opt Out Movement that led to 40% of North Shore students and a similar percentage Island-wide to boycott the exams last year. NYSED's letter stated that this year's test was created by a company called Questar - not by Pearson, the standarized test-making giant that has received a great deal of criticism for among other things, exam questions not being designed by teachers and not releasing those questions after the administration of the test. Dr. Melnick said that this year's tests have in fact been created by Pearson, but that the 2017 exams would be designed by Questar. Additionally, while the letter accurately states that the tests will be shorter this year than in the past, the Superintendent said that the letter did not state that they would "only be about six minutes or three questions shorter." "I believe the letter was intentially put out to quiet the opt-out movement with inacurrate information." Dr. Melnick said. What is accurate in the letter, he explained, was that the tests will be untimed this year. Trustee Sara Jones said that that change has received mixed reviews - that while those students who had difficuly finishing the test would receive more time, "a logistical nightmare" would be created as perhaps an entire school day would have to be taken to administer the exams. Additionally, Dr. Melnick explained that because students are not longer required to sit for a certain amount of time, it could lead some to rush through the test. He agreed that it does create logistical problems, and there was discussion as to whether it was better to have students who finish quickly to get up and leave and go to the library, or to have everyone sit for a certain amount of time, and to move those who don't finish to another location to complete the exam. Ultimately, Dr. Melnick said, NYSED's letter "leads you to believe that these are different tests this year created by Questar, and that is simply not true." Additionally, the Superintendent said that he did not believe the changes to the test would significantly reduce the testing culture in many districts. Although teacher evaluations will not be based on student test scores, NYSED, he said, would be releasing an "advisory" score for teachers, the publication of which he said would continue to put pressure on teachers to teach to the test. Dr. Melnick stated that the New York State Department of Education has now mandated that, beginning in the 2017-18 school year, all elementary schools will be required to have guidance counselors with a ratio of no more than 250 students for each counselor. That, he said, would require North Shore to hire four counselors. He said the District reached out to the state to ask if social workers, which the district already has in each of the elementary schools could fulfill that role, and the response was, "No." 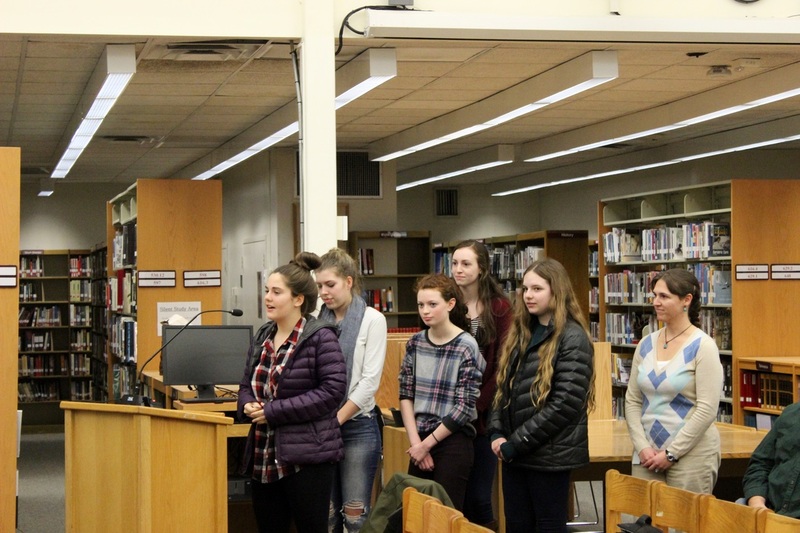 Five students from the North Shore High School Environmental Club addressed the school board on Thursday February 11 urging the district to adopt a recycling program. They said they would get the ball rolling by placing recycling bins in each of the classrooms and promote their use through a public relations campaign. In the past, they said, such a program did exist, and that in 2010, the school managed to recycle 20 tons worth of material. Dr. Melnick said that the program had been eliminated due to costs charged by carting company, but that he would work with the Environmental club in an effort to re-establish the program. The five trustees present at this past Thursday night's School Board meeting voted unanimously in support of a resolution urging state lawmakers to pass legislation that would assign a monitor for the School Board of the East Ramapo School District in Rockland County to protect the interests of the 9,000 students in its schools - 90% of whom are black or Latino and 2/3 economically disadvantaged. A state investigation into the School District's fiscal practices last year found that the School Board there had made draconian cuts to educational programs while diverting funds to subsidize the education of 24,000 children residing in the district who attend private yeshivas. Seven trustees on the nine member East Ramapo School Board send their children to the private schools. From 2009 to 2012, the district cut more than 400 staff positions (including all of its social workers), eliminated many after school clubs and sports programs, replaced full day kindergarten with half-day, and increased elementary class-sizes by 25% . In the meantime, funding for transporting students to private schools has increased by 70% and an investigation into the school's fiscal policies revealed that one-third of the East Ramapo budget goes toward subsidizing special education services for students attending private schools - subsidies the New York State investigator concluded are not required by law. ​In 2010, the state annulled the school board’s sale of a public school building to a yeshiva after it was discovered that the purchase price was millions of dollars under market value. The actions of the school board has divided East Ramapo's Orthodox Jewish Community, with the Orthodox social justice group, Uri L'Tzedek,calling for state intervention in 2014. That spring, the group began collecting signatures for a petition urging Governor Andrew Cuomo to take action that would provide state “fiscal and administrative oversight” of the Rockland County district. The organization Strong East Ramapo, formed in June of 2014, has since spearheaded efforts at getting an oversight bill passed through both houses of the legislature. In November of 2014, Federal Prosecutor Hank Greenberg, assigned by the State Education Department to investigate the district released his report in which he concluded that the district was "recklessly mismanaged." ​The resolution adopted by the North Shore School Board this past Thursday evening was introduced by Trustee Toni Labatte during the "New Business" portion of the meeting and was authored by Strong East Ramapo. The proposed bill would grant the monitor veto power over school board decisions. ​ Trustee Michael Nightingale commented that a similar situation has occurred in the Lawrence School District in southwestern Nassau County. "The monitor is to insure that the students there are treated fairly," said Board President Herman Berliner. "I really think we need to make a strong statement."